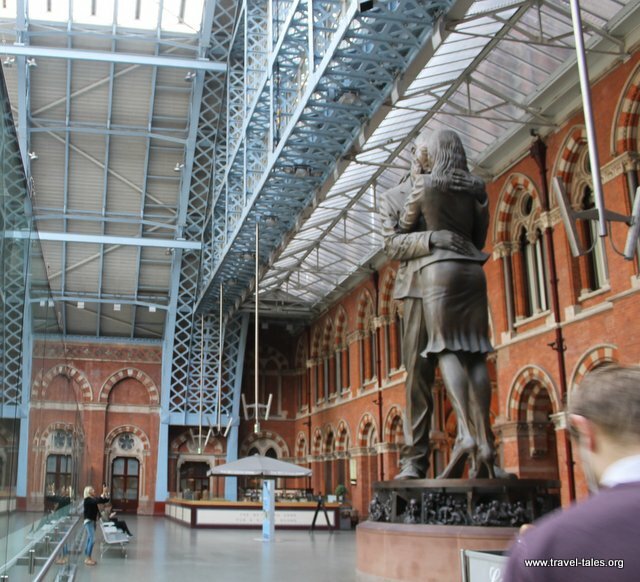 St Pancras tweeted this link to me about last week’s post, a YouTube video about One More Time. You can watch it here. The two permanent works of art are both bronzes. To one side, by the Booking Office Bar is a bronze of of Sir John Betjeman, the English Poet credited with saving St Pancras Station. There are plaques with his poetry inscribed leading up to the bronze of him awaiting someone’s arrival or embarking on a journey of his own. It was created by Martin Jennings and placed in the station at its opening in 2007. The other, by Paul Day is of a couple greeting each other (or taking leave of each other?) at the end of the platforms. It is enormous, and at eye level around it are depictions of aspects of the station; commuters, railway workers, a homeless person, travellers with luggage etc. I was rather amused by the part of the sculpture that were highly polished by frequent touches from passers by. A hand, a dog and a shapely buttock!